Sometimes you get to see the same exhibit in two different venues. I saw the Charles LeDray show workworkworkworkwork at the Whitney Museum and at the MFAH, for example. And the two sites made a big difference--the Ledray show in the huge, high-ceilinged MFAH seemed a bit lost. It really required a more intimate setting, which the Whitney provided. Rigoberto A. Gonzales' exhibit Baroque on the Border had the opposite problem. When shown at the Art League in Houston, the work was so large that it felt cramped in the relatively small gallery where it was shown. 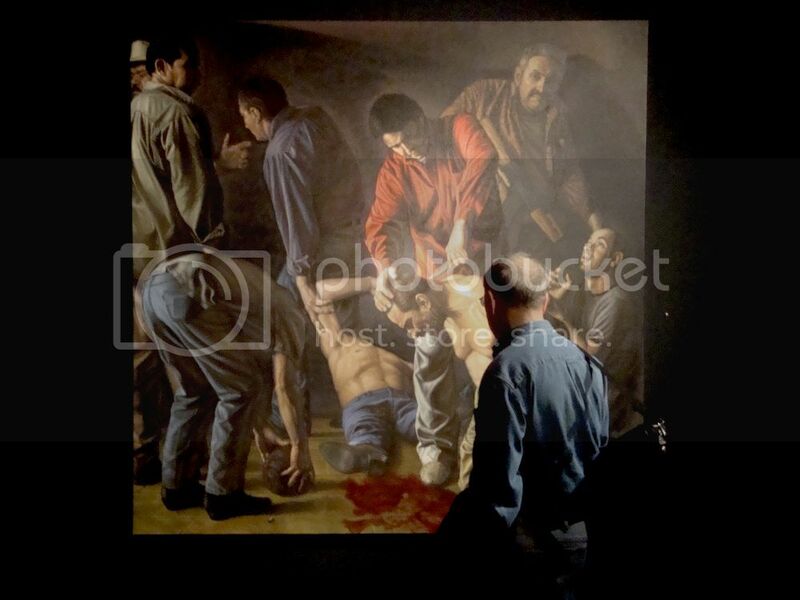 Gonzalez' El Dia 17 de Febreo del 2009 en Reynosa, Tamaulipas, Mexico is a heroically large painting--too large for the Art League. See how the painting is flush against the ceiling. Also notice the lighting. The Art League's track lighting is unable to bathe the entire painting in an even glow, so we end up with "hot spots" where the light is stronger on the canvas. Instead of illuminating the canvas, it's as if spotlights are being shined on specific portions of it. 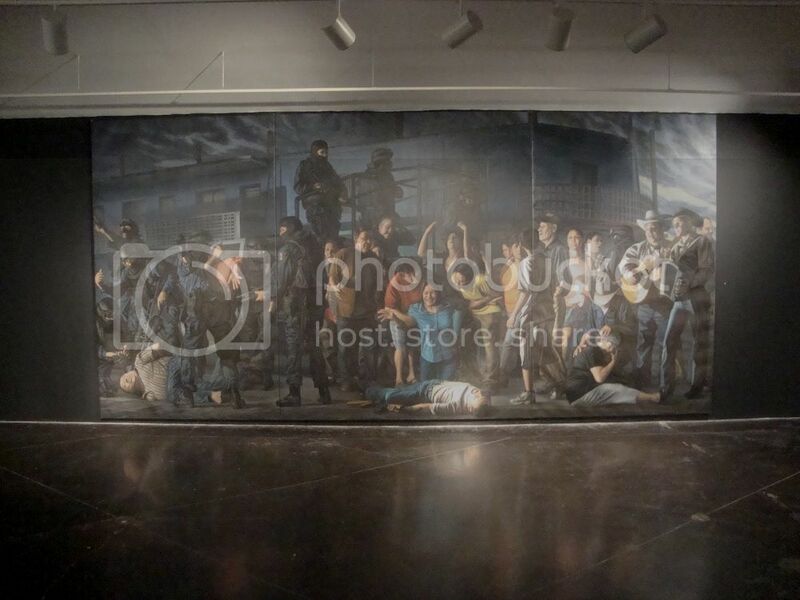 The same painting is currently on view at the Emma S. Barrientos Mexican American Cultural Center in Austin. The exhibition space there is magnificent and perfect for large pieces like this. The ceiling (with skylights) is quite high. The piece has room to breathe. And because the lights have a sufficient distance from the painting, you don't get the spotlight effect. 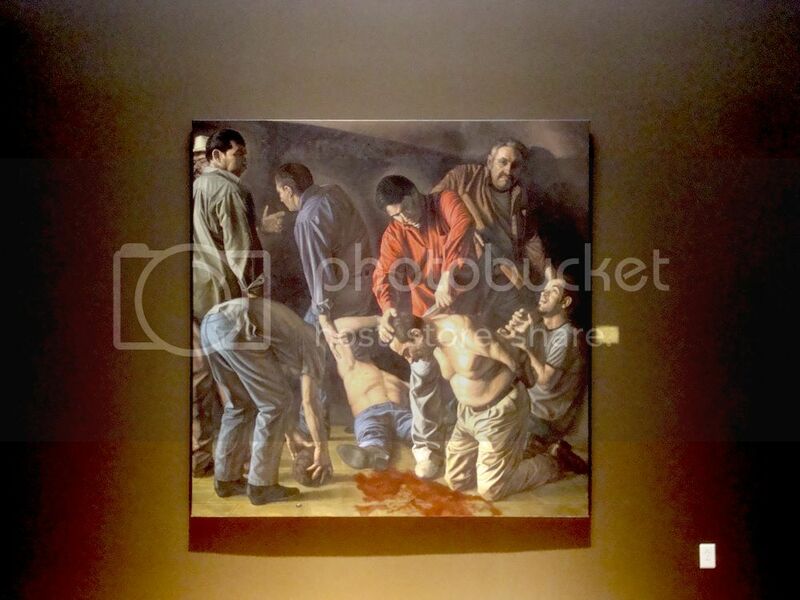 Beheading at the Art League shows the spotlight effect. 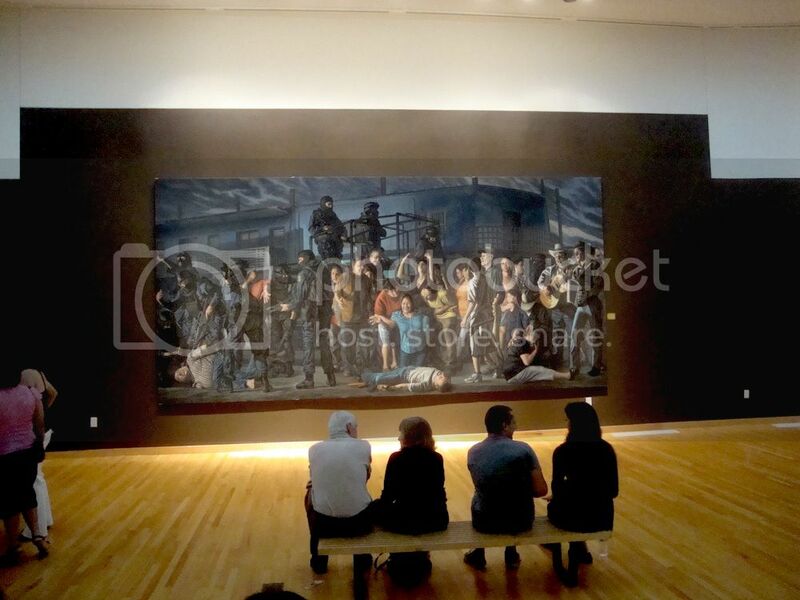 While the same painting at the MACC is lit evenly, so that no portion of it is dark and no portion is washed out. I don't mean to suggest that the Art League is bad at installing artwork. On the contrary, I've seen many beautifully installed shows in the exact same space where they hung Baroque on the Border. The problem was that the art was simply too big for the space. The spacious MACC gallery was perfect for an exhibit of this work. When I saw the show at the MACC this past weekend, it was as if I were seeing it for the first time. The difference was that profound.